homeone.com.au›Building Forum›Building, Renovation & Maintenance›Building A New House›Which Slab is Better? Waffle Pod or Raft Concrete Slab??? Re: Which Slab is Better? Waffle Pod or Raft Concrete Slab?? Waffle slab sits on top of the ground (possibly on piers/footings if needed) traditional slab is in the ground (possibly on piers/footings if needed). Both as good as the builder and the engineer who built them and the consumer that maintains them. Don't make a competition out of these types of slabs , that is stupid because all evidence - good and bad - is anecdotal. I have never seen a scientific study on which slab is better. Basically, don't be a nit wit. Waffles have been shown to be more susceptible to ground movement on highly reactive soils. 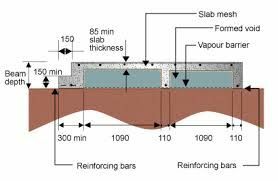 Some engineers now design a hybrid which is a waffle slab with dug in deepened edge beams.This reduces the risk of heave and keeps the builders somewhat happy. Raft Slab : The steel reinforced raft slab is also commnly called an engineered slab. It consists of thick steel reinforced concrete slab integrated with steel reinforced concrete beams founded into the bearing soil for strength and support. Waffle Slabs : Waffle slabs are a reinforced concrete footing and slab system constructed on ground. They consist of a perimeter footing (edge beam) and a series of narrow internal beams (strip footings) at one metre nominal centres running each way. The whole footing and slab system is constructed on top of the ground. Most of the builders go for waffle pods because they can save some $$ on earthworks. However, good drainage and maintenance/prevention of water access is paramount for waffle pods, especially on highly reactive soils as they are prone to slab heave. Call me prejudiced, but you want a house that lasts at least 50 years and easy to maintain - go for the slab in ground, not on ground. Also, good engineers prefer to stay out of waffle pods in general, but on reactive soils specifically. They actually lose on earthworks because every site has to be cut flat unlike conventional raft slabs.This is one of many reasons why slab heave is more common these days because sites are dead flat with poor drainage.In the past you could have some slope on site and still be able to construct a conventional raft slab. Where they save money is it can be up to two days faster with a waffle. If you want to have a volume builder on your books then you will have to design for waffles unfortunately. I am with you though and would only have a conventional raft slab on reactive soil. This is a good thread. It would be great to have some scientific study though, not just anecdotal or quoting from engineer websites or old court cases. The uncertainty with anything in the ground is the cost uncertainty for everyone, who knows how well the trenches will be dug, will rain collapse the trenches, will they be over excavated, will soft pockets be found. They are also potentially unsafer from a worker point of view to construct. Along comes waffle and gives everyone a simpler and more cost certain outcome with similar if not better structural performance - this is the main reason waffle has been so successful as a slab system. Last edited by Engineer on Feb 06, 2019 2:14 pm, edited 1 time in total. The uncertainty with anything in the ground is the cost uncertainty for everyone, who knows how well the trenches will be dug, will rain collapse the trances, will they be over excavated, will soft pockets be found. They are also potentially unsafer from a worker point of view to construct. And then it brings yet another uncertainty (but arguably a bigger one and much harder to control ) - maintenance of proper drainage during and after the build. My husband is a concretor and personally prefers slab on ground. Some sites you need waffle pods (I assume as otherwise you would need a lot of piering which would be very expensive). I've heard when waffle pods first came out they were done incorrectly and people put heavy furniture in their house that went through the floor , and rodents got in under the slab and ate out the 'pod' bit. Of course waffle pods are much more common now and I seriously doubt that would happen anymore. As a builder myself I prefer raft slabs. Waffle pods in my opinion are closer to the risk edge and savings to the builder are not passed on to the homeowner. Slabs in general are a con of the century against homeowners and profit printing machine for the builders. There are hundreds of thousands BV dwellings on strip footings and stumps in Melbourne that have performed just fine for 50 years. Have a look at your site costs and slab upgrade costs, they alone will likely pay for strip footings, stumps and timber floor. There is a very good guide from the CSIRO - Foundation Maintenance and Footing Performance: A Homeowner's Guide. Drainage, tree effect and anything that will cause differential movement around and under your slab is important especially on reactive sites. I supplied this report when I was doing Geotechnical investigations...but was never sure if it ever made it to the home owner. Builders and Structural engineers are very aware of this publication. i prefer raft mainly for reasons ,dont want to stress about the barely good enough nature of a almost under engineered waffle slab, apart from perfect conditions with perfect owners,be aware ,just too many MUST BE DONE PERFECT TO WORK WELL TROUBLE FREE. Can you insist with the builder to go for an in ground concrete slab? Our first home was built with an in ground concrete slab a decade ago, soil type M. I can see waffle pod slabs are pretty common these days. We are building again and in doubt which slab to go for. Soil type might be H or M. I thought an in ground concrete slab is a more solid foundation. The reason they are so popular are they are cheaper than stiffened raft.Due to so many failures particularly in the western suburbs engineers have been starting to do hybrid slabs with an excavated deepened edge beam in an attempt to stop moisture ingress under the slab. The waffles have several major problems. *Granular bedding material (used to be scoria) which allows moisture to spread under the slab. *The block has to be perfectly flat usually causing drainage issues especially in highly reactive sites. never exposed during trench excavations. *"E" reactive sites are often called "H2" because once it is an "E" you can't use a waffle.If you constantly call sites "E" you will lose volume builders because they only want waffles.You may say well to bad the site is what it is and I agree with this but the fact is it influences what geotech's are prepared to say so waffles are put on "E" sites. Great points - the theory is that a waffle is structurally stiff and can span over some differential movement in the slab - in practice however I agree, where there is poor building practice and if you have an E class site the waffle should not be used. If you have the potential for trees, drainage to affect the slab, then the waffle will be more prone to this than a raft. As a minimum, figure 3.4 in AS2870 should be consulted for your build - I have attached this for those that are interested. Keeping the void formers in place before and during the pour can be an issue. Gawd, there were some horrible pics of former displacement in a waffle pour on this forum recently. You can build E waffle, no law says you can't. It just must be engineered, extra concrete, extra steel, piers etc and the usual drainage requirements. All this anecdotal talk is fun but where is the long term scientific evidence? We all know the waffle slab disaster of the late noughties when the longest drought in Victorian history broke etc and all the waffle pods heaved and Metricon getting sued etc, but that all coincided with Metricon becoming the biggest project builder in Australia, so of course they had the biggest exposure. Plus they were building on poorly classified land, which hadn't been tested thoroughly enough. Since then the standards have been upgraded to find a compromise that suits builders and engineers. Let's see the results of a proper scientific survey before we try and scare people eh? I don't believe proper scientific research is something which can be done here, what will be study protocol and methodology like? And how much it will cost? I would say that if building-expert, who have inspected 1000s of houses, says that waffles on clay tend to me much riskier to heave and require more maintenance, then it is likely to be so. It also pretty well aligns with the theory - waffles have much higher odds of getting heave due to bad drainage or maintenance due to the fact that it is much easier for the water to get under slab. It's a heavy read but explains almost everything that happened with the slab heave in Melbourne. Last edited by insider on Feb 06, 2019 7:54 pm, edited 1 time in total. Fully agree, system designed for volume boys, have a look at vbag site, up to 80% of new builds will have some sort of significant problems, added to the fact that the majority of the best builders, high end builders, old school quality guys still prefer raft, but no matter what it defys belief that concrete right around your home with a fall away from house isn't mandatory, it should be part of ocucpancy certificate, but volume boys don't want this as, their get out of jail card will disappear. Waffle slab know what your getting.Waffle slab know what your getting. Exposed waffle pod after slab pour?Exposed waffle pod after slab pour?